Hello Mommies, good news from the brands that I bet you too loved like Chico, Fisher-Price, Vtech etc. It's a Sale Alert! Woohooooo!!! 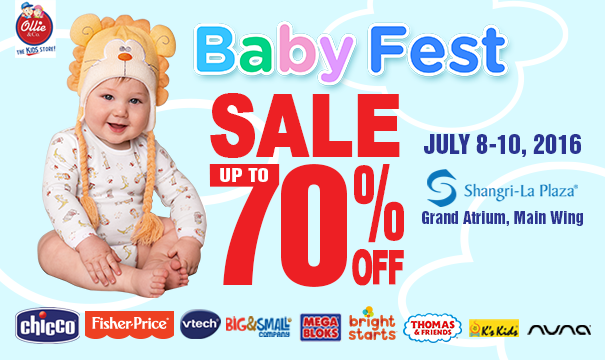 Be ready to find the best deals and save up to 70% off on Chicco, Fisher-Price, VTech, Mega Bloks, Bright Starts, Big&Small, Thomas & Friends and more on July 8 - 10 at Shangri-La Plaza, Grand Atrium, Main Wing. Not just that, exciting prizes and giveaways await all shoppers at this 3-day big event for the whole family! Your kids will definitely have a blast too, as they meet and greet the popular characters from Shopkins and Thomas & Friends! Spread the word and invite others mommy friends too. The more the merrier right? and that would be a great shopping experience.